Using a mini trampoline will help you exercise your lymphatic system, which rids your body of bacteria, toxic wastes, fat globules, trapped protein and dead cells, says nationally known nutritionist Ann Louise Gittleman, author of "Fat Flush Fitness Plan." Waste materials as well as immune cells are circulated through this system when the muscles in your arms and legs move—it does not have a "pump" like the circulatory system does with the heart. Rebounding on a mini-trampoline can increase lymph flow 15 to 20 times, says Verne Varona in "Macrobiotics for Dummies." Certain mini-trampoline exercises help you get your lymph drainage system moving. Use light bouncing on the mini trampoline for at least 10 to 15 minutes to stimulate your lymph system, recommends Ellen Kamhi in her book, "Alternative Medicine Magazine's Definitive Guide to Weight Loss." The rapid changes in gravity cause your lymph channels to expand and enhance lymph circulation. In fact, when you land on your trampoline, you experience twice the force of gravity. This makes bouncing more effective than running for stimulating lymph flow, says Kamhi. Start each bouncing session with diaphragmatic breathing, and breathe deeply, advises Linda Page, author of "Healthy Healings Detoxification." Use a marching bounce with high knees as an alternative or addition to light bouncing, Gittleman recommends. 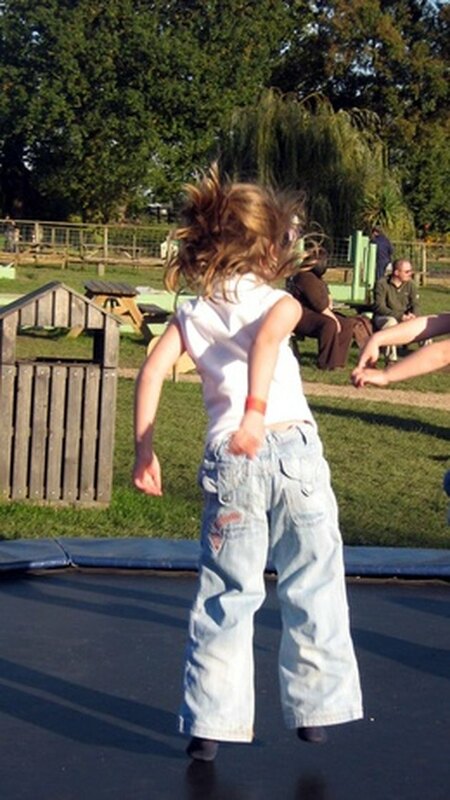 As you march in place on your trampoline, bring your knees up as high as you are able without compromising your balance. Swing your arms forward and back as you bounce, with your right arm forward when your left knee is up and vice versa. Use a strength bounce by bending your knees and pushing up into a jump. Swing your arms upward when you jump. Make sure you bend your knees as you land. Gittleman recommends incorporating this exercise into your mini-trampoline routine for five minutes. Kick bouncing incorporates your arms and legs. Bounce and kick one leg out in front as you come up. Return it to the trampoline as you land. Bounce again and kick the other leg out. Continue to alternate. When your left leg is out, swing your right arm out as well, and vice versa. Do this exercise for five minutes, says Gittleman, who recommends working up to 40 minutes of bouncing overall and incorporating a number of exercises during your mini-trampoline workout. Does Bellydancing Help Lose Belly Fat?